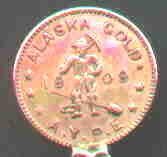 The Alaska Yukon Pacific Exposition (AYPE) was held in Seattle in 1909 to celebrate the conquest of the rugged Alaska frontier and to pay homage to the tremendous wealth which accrued to Seattle, Washington as the main gateway to Alaska. The Alaskan Gold rush of 1898 was very well documented and many books and movies provide a deep insight into the people, mining, and tremendous problems that were faced. It is impossible for me to explain in a few sentences about the monumental natural and man made problems which the miner's encountered. Therefore if you have more interest in this subject I do suggest further research. 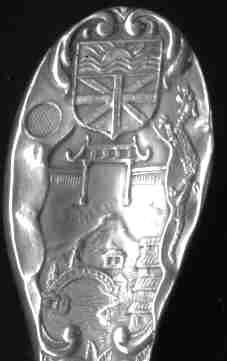 The AYPE was about gold, that magical metal which has intrigued men since the beginning of time. Here, as in previous gold finds, men and governments risked everything against hostile conditions (and often lost) to extract the precious yellow metal from the earth. Apparently some spoon manufacturers set up a spoon making process at the AYPE expo. 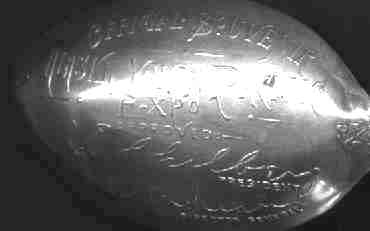 Mayer Bros. supposedly made about 145 spoons per day while the expo was active. 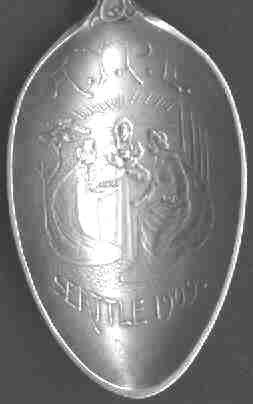 This spoon features a fairly common SSMC handle with the official symbol of the fair in the bowl. Paul Middents has written a terrific article about Joseph Mayer at the AYPE. Click to see this article. 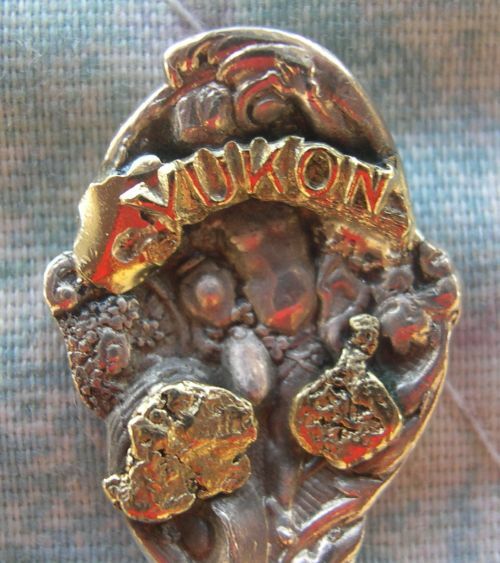 Dawson was the center of the Klondike gold rush and was the capital of the Yukon territory at that time. 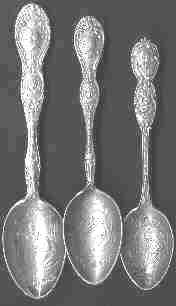 The patent date ('88) on the Gorham spoon is not a reflection of when the spoon was made. 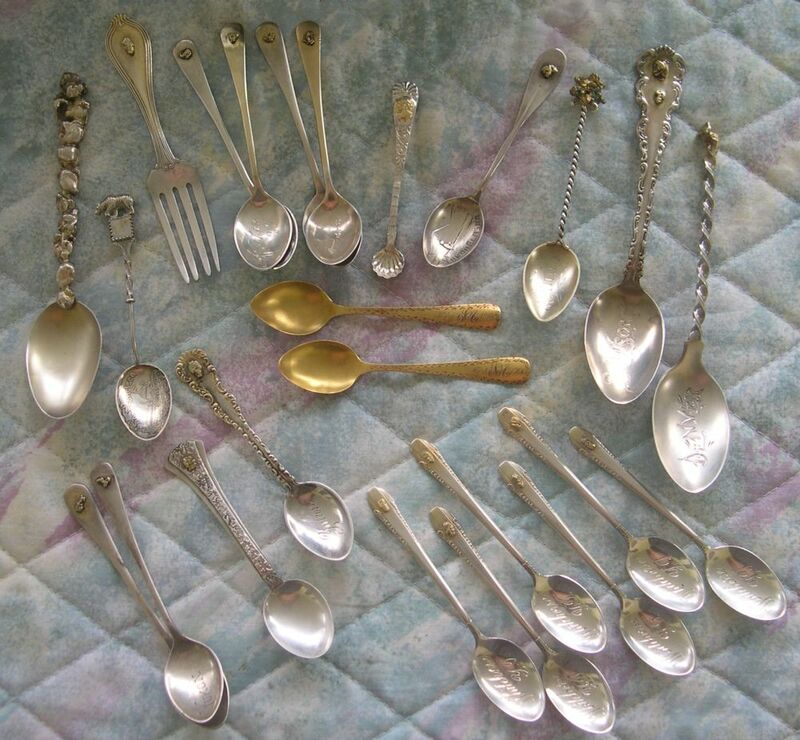 Pure gold placer nuggets are soldered to these spoons which are all engraved "YUKON" in the bowl. Mayo is known as the "heart of the Yukon"
I suspect that the gold is from Alaska. William Seward, Secretary of State, was the purchaser of Alaska from Russia. 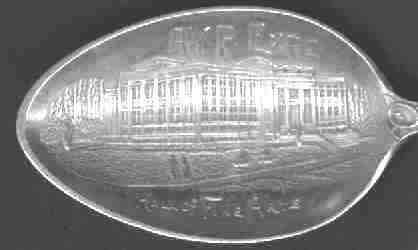 He is now known as the "Father of Alaska", although at the time of the purchase it was known as "Seward's Folly"
The Official Souvenir Spoon was available in different sizes.